This company purchased power in bulk from the Canadian side of Niagara Falls and undertook to transmit it eastward 160 miles to Syracuse, with many branches serving communities along the way. 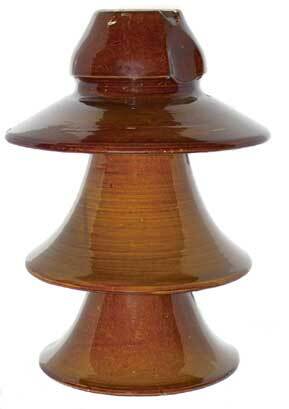 Ralph Mershon was in charge of the design and once again came up with a special insulator – M-3890. The two parallel lines ran at 60kV and could handle 30,000 horsepower each. The project was touted to be “the most important of its kind anywhere in the world.” Mershon was asked whether, in view of the Guanajuato experience, a grounded wire at the top of the tower would be advisable to protect against lightening. He replied, “We are trying to avoid the use of the grounded wire on account of the expense of putting it up.” That economy came at a devastating price. Insulators were shattered, punctured and otherwise destroyed in vast numbers. 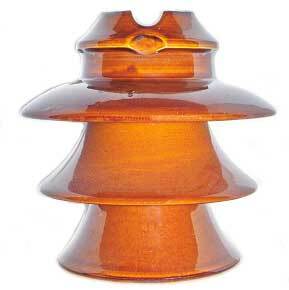 The full story is told in Elton Gish’s book Multipart Porcelain Insulators. 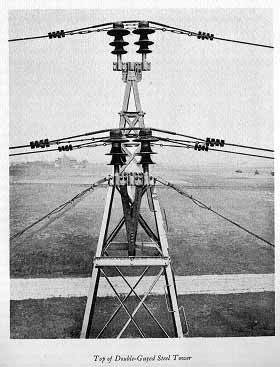 In the end, the insulators were fitted with arcing rings devised by L.C. Nicholson and most of the M-3890’s were replaced with the shorter M-4338 cross-tops.